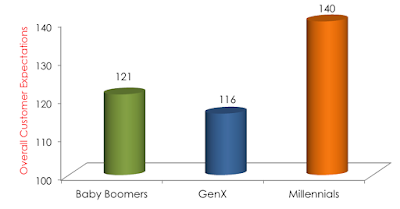 As more marketers have focused on the Millennial Generation with efforts focused on capturing this cohort’s attentions, major budgets are being planned in the mistaken belief that Millennials are less brand loyal than other age cohorts, and require additional attention to create brand preference. A recent assessment of 12,300 Millennial consumers in 63 categories conducted by Brand Keys, Inc., the New York City-based brand loyalty and emotional engagement research consultancy (brandkeys.com), proves that emotional values and higher expectations not only play a greater part in the Millennial decision-process but that a brand’s ability to deliver on required emotional values trumps rational ones every time. It turns out that the loyalty bonds created by doing so for Millennials are stronger than those of other age groups. In 1985, when the first of what was christened the “Millennial Generation” were about 5 years old the purchase-decision process was more rational than it was emotional, calculated to be a ratio of 70:30. That meant rational values having to do pricing, product quality, numbers of distribution points, and advertising tonnage, were more important, more leveragable, and more differentiating to consumers than emotional values. 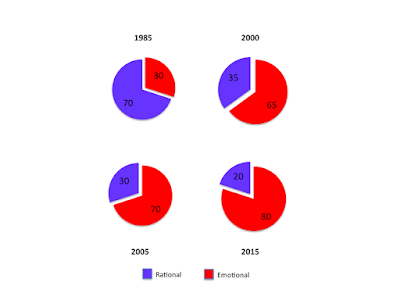 In 2000 the ratio shifted to 65:35,emotional to rational. Five years later the ratio reversed the 1985 numbers, this time 70:30, but with the preponderance of the decision process turning emotional. This year, 2015 – as the first Millennials turn 35 – the decision process is decidedly more emotional, at a category-generalized ratio of 80:20. Emotional values like customization, meeting personal emotive needs, the ability to meaningfully “talk” to the brand that actually “listened,” and a sense of authenticity, became more important in the brand bonding decision-process as consumers had more and more access to the Internet and lived hot-wired mobile devices and, consequently, more and more empowered empowered. Millennials are demanding real reasons to be loyal. Complicating marketing efforts, overall, cross-category expectations (examined by generational cohort and indexed versus a benchmark of 100 to provide comparability) showed Millennials to hold significantly higher expectations regarding categories and brands than any other age group as well. One thing that crosses all generational cohorts as regards brand loyalty and engagement is that brands best able to meet the consumers’ expectations for the values – particularly emotional values – that drive the category are always the brands that show up on the top of consumers’ shopping lists. A review of the Millennial loyalty leaders in the 63 categories included in this analysis revealed that 91% of them were the category’s leaders. These included brands like Apple, Nike, Chipotle, and Old Navy. Ultimately brands that are able to stand for the right emotional values, maintain relevance, and better meet Millennial’s expectations have shown higher levels of positive consumer behavior in the marketplace and higher loyalty levels than any other generational cohort. The secret, of course, is identifying and measuring what expectations Millennials hold for which emotional values and then planning how to communicate them to consumers in an engaging manner. And unfortunately, that’s a more complex process than just adding more social networking or more storytelling to the marketing budget.